Cherry Grove - August weeks available! Would love to have you and your family. Summer in Cherry Grove has been FANTASTIC !!!!!!! 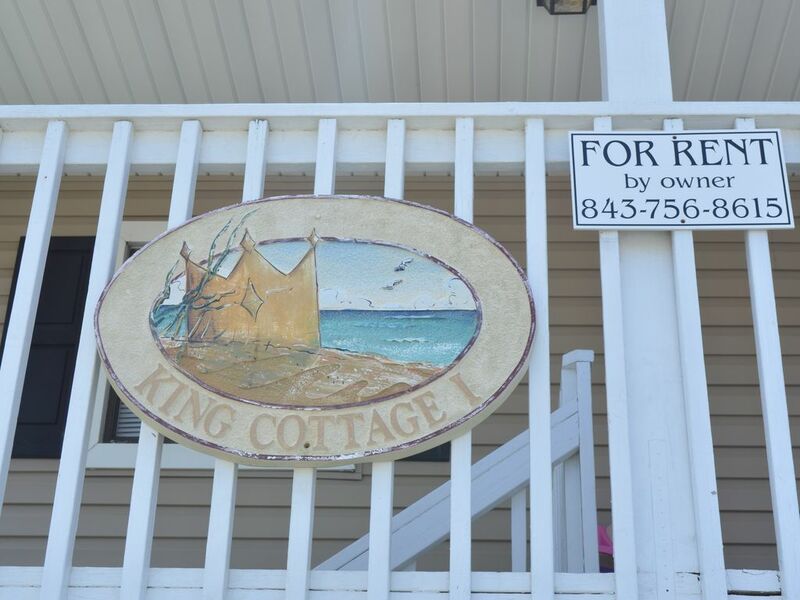 Book now to enjoy a view of the Cherry Grove Beach and Marsh from the 3 sun decks of this nicely decorated and well furnished home located on the corner of 48th Ave. N. and Ocean Boulevard just across the street from the ocean! About Twenty Steps and You Are On The Beach !!! The King Cottage I has 4 very spacious bedrooms that will comfortably sleep 13, 2 full baths, plus an open kitchen and great room that's great for family fun. Directly across Ocean Boulevard at 48th Ave. N. is a public beach access, which allows a spectacular view of the ocean from the open sun decks on the side. This is truly one of the more desirable beach homes in the Cherry Grove area. The Master Bedroom of the King Cottage I has a very comfortable queen-size bed and a twin for the little ones to be near! Bedroom 2 has two doubles. Bedroom 3 has one queen. Bedroom 4 has two double beds. All bedrooms have plenty of room to spare for all your personal items. There is a washer and dryer to keep your laundry fresh! We love sitting on the our deck in the afternoons to listen to the sounds of the ocean and watch the people walking and passing by. There's not a bad room in the house! This house is spacious, very comfortable, nicely decorated and fully furnished for your family's vacation enjoyment. The King Cottage I features central air and heat, ceiling fans, 2 large sofas and plenty of sitting chairs, phones, Flat panel TV's, a cable-plus lineup of TV channels, PS3 playstation with games, fully-furnished kitchen with dishwasher, microwave, refrigerator, mixers, electric can opener, coffeemaker, toaster, cookware and utensils, electric stove, washer/dryer, ironing , mirrored vanities, smoke detectors, fire extinguishers, ample parking, and an enclosed outside shower (with hot water) and dressing room. Linens (sheets and towels) are included in rental rate. Need even more space? The King Cottage II (located adjacent to the King Cottage I) has 6 bedrooms, 4 baths and will sleep 24 people. Put these two properties together and you've got a total of 10 bedrooms, 6 baths, and sleeping accommodations for 37 guests. Ask the owner about availability of both properties if interested. Perfect for those large family reunions. What a fantastic location for a family vacation! The beach is wide, clean and beautiful! Cherry Grove is the most popular family beach in the Myrtle Beach area. The Grand Strand has numerous entertainment venues for the family and you are minutes away. Outside Furniture; Full Kitchen; Air Conditioner; Cookware; Kitchen Utensils; Microwave; Coffee Maker; Dishwasher; Full Size Refrigerator. ; Alarm Clock; Cable; 3 TVs; VCR; DVD Player; Full Size Stove; Outside Deck; Covered Outside Deck; Porch; Washer/Dryer In Complex; Departure Cleaning Required: Covered Parking; Outdoor Grill; Outside Shower. This year we have added Playstation II for the kids.. and adults! Hi! We are Greg and April King! We live in Loris, SC which is about 20 minutes from Cherry Grove. When we have the opportunity, we LOVE staying at the beach and enjoying all the "tourist" attractions. We have two beautiful kids that love the surf and sand as much as we do! This rental location has been in our family for many years, and we enjoy sharing it with our friends and family. It's a great place to rest and relax. Feel free to contact us with any questions about our "home away from home"! We look forward to sharing our little piece of paradise with you! We have recently updated several aspects of the property. We are continuously updating the house so that is why the property has been off the listing for the last few weeks. New paint inside and out and updated furnishings along with updating TV's, Wifi etc. We like to use the property ourselves and we want the amenities that will make the guest feel at home. The property is in a excellent location. With large decks and excellent view all members of your family will enjoy this location. About 25 steps from the ocean! On the corner of Ocean Blvd and 48th Ave North. House is located on the corner of 48th Avenue and Ocean Blvrd in the Cherry Grove section of North Myrtle Beach. Excellent views in all directions. Short drive to Calabash NC which is well knownfor its seafood. North Myrtle Beach is known for the beach dance the "Shag". Yearly shag festival on Main Street NMB. Short walk to Cherry Grove Pier.